Raise your hand if dinners can sometimes be a challenge; if coming up with five to seven meals every week gets old; and if all the prep work just makes you want to throw the [kitchen] towel in. If you raised your hand or nodded your head to any or all of these, you are not alone. While we love to cook in the Hill House, there are just some weeks that we are so over it. 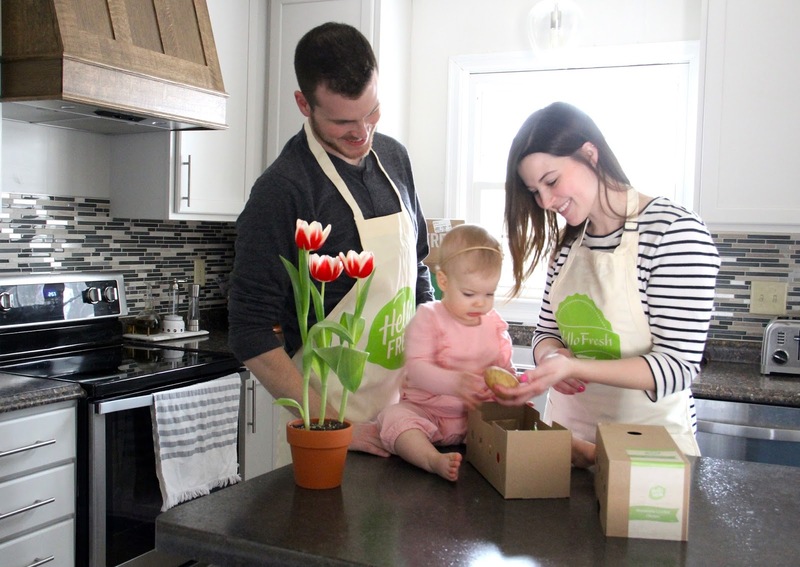 Whether we're busy with projects, getting home from work later than planned, or dealing with a fussy baby who refused her afternoon nap, there are a handful of reasons why having our meals delivered to our door, ingredients ready for a simple prep, and dinner completely thought out feels like a lifesaver. HelloFresh isn't just an answer to dinner prayers, but it spices up our dinner routine with fun new ways to create a meal. I love carrying the inspiration over into other meals too. In addition to the novel recipes, I can't say enough about having the ingredients for each meal already divided up, pre-measured, and ready to be whipped up. It makes the prep time SO much easier, and the clean-up that much quicker. Easier than that, the meals are delivered straight to my front door. Amen?! For our week, we selected three meals for two people. Greer was able to enjoy some of the meals with us, but since she's still little, she's not eating all the things we are quite yet. I must say though, she was crazy about the pearled couscous in the Sweet Italian Sausage with Couscous and Spinach. If Greer were eating all the things with us, we would have opted for a family sized portion. Since we went with a two-person meal, there was exactly enough to feed and fill both husband and I up. Only one meal had leftovers. And since I'm not a fan of leftovers, I fell even more in love with HelloFresh. Over the next two days we enjoyed Mozzarella-Crusted Chicken with Blistered Tomatoes and Potato Wedges (seen being cooked) and Citrus Skillet Shrimp over Basmati Rice. So how does it taste? Awesome! I kid you not. HelloFresh did not disappoint us. And the variety amongst the boxes kept meal prep exciting. We never felt like we were eating more of the same thing, which I appreciate. Everything, from the produce to the meat, was fresh and tasty. Let's be honest, sometimes I just don't want to cook at the end of a long day. But, HelloFresh makes a way for us to get in the kitchen together, enjoy what we're making (with little time needed), and eat a well-rounded meal. Not to mention, their customer service is phenomenal. All in all, our experience with this ready-to-make-and-eat concept, delivered to our door I might reiterate, will definitely have us coming back! 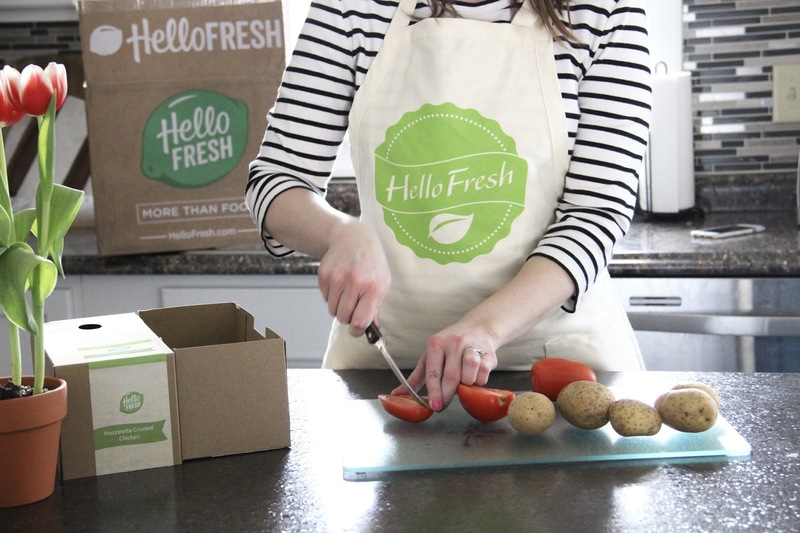 If you've never tried Hello Fresh, what's stopping you? Use ASTLEIGH35 for $35 off of your first HelloFresh box! A special thank you to HelloFresh for sponsoring this post. All opinions are my own.